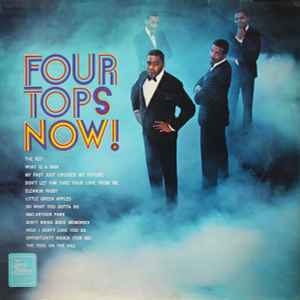 Four Tops ‎– Four Tops Now! Record Company – The Gramophone Co. Ltd. Printed By – Garrod & Lofthouse Ltd.
Made By – Garrod & Lofthouse Ltd. Published By – Jobete-Carlin Music Ltd.
"File under Popular : Male Vocal"
"6909 TPS Printed and made by Garrod & Lofthouse Ltd. Patent No. 943,895 TML 11113 STML 11113". A1 to A4, B3 to B5: Jobete-Carlin Music Ltd. NCB. A5, B6: Northern Songs. NCB.